Balancing Touch Reflexology: Why are there Different Reflexology Charts? Why are there Different Reflexology Charts? One of the answers is that all the Reflexology schools have not sat down to make “The Reflexology chart”. It is very interesting to me that when you look at medical anatomical charts, the person in the chart has perfect posture, his palms are open towards you (I don’t know anyone that walks around like this except if they are dead) and no extra fat can be found on his body etc. So it is very fitting when Yvette says “and no individual fits it!” This is why X-rays are taken before any form of surgery is performed since we are all so different. Anatomical body parts can be in slightly different places. This also gives insight as to why reflexology charts are different, by feel of the feet there are slight variations as to where the points are found from one client to another and so it is a very difficult task to have one chart that fits everyone because the truth is in general it might fit the majority of people but not all. Having said that, most of the reflexology charts out there have many of the points in common but there are some small and great differences. These are the most common form of Reflexology chart; they put the parts of the anatomy on the feet as they are in the body. These Reflexology Charts usually have a base in Zone Therapy. 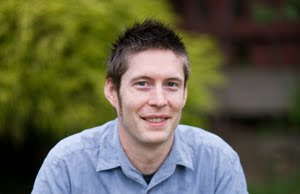 They may also tend to portray a personal experience of working with clients. 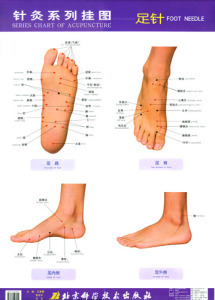 Acupuncture Foot Charts usually originate from China – These are based on acupuncture meridians. 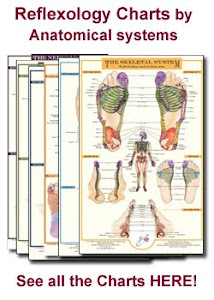 These charts reflect correspondence with other parts of the body but not in direct reflection of how the anatomy falls on the feet like in the above reflective charts. 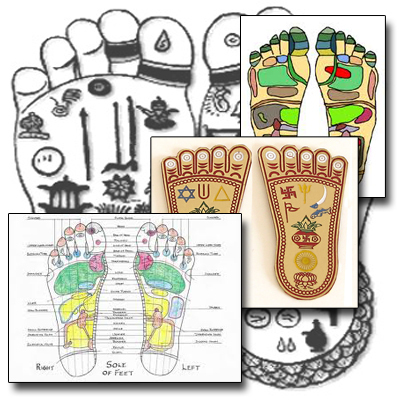 Ayurveda or Indian Charts – These are based on Marma points which are points that come from Ayurveda massage and there are points found on the hands and feet that are called Marma points. These are in abundance throughout Asia. There are a number of pictographs and symbols whose meaning tend to be more toward the spiritual life for example the feet of Buddha and of Vishnu’s etc. These are done for an artistic effect, for visual stimulation, attraction and mostly for selling products. 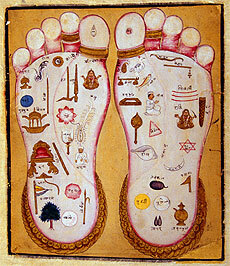 For example Reebok produced a Reflexology ad using a very artistic chart. The body shop had a reflexology massaging tool and printed on the outside of the bag was an artistic reflexology chart. What Reflexology Chart should I use then? An interesting point: When a reflexologist, no matter what chart they use, produce positive results. The real question then is … what reflexology chart speaks to you? Which reflexology chart is the easiest for your clients to understand and attracts them to want to receive a session from you? 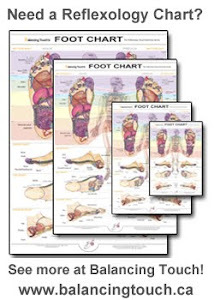 We at Balancing Touch have created a series of Reflexology Charts called The Reflexology Visual Dictionary Series which is composed of Reflexology Charts, Books and DVD’s.